I am sure all of you know by now that I am bit of a foodie and I love to try new recipes and anything unusual. I have tried many different cuisines and even snails, frogs, stingrays, rabbits, kangaroos, and camel too. But I have to admit, my native cuisine, Newari, is always close to my heart. Even though I love momo and think that it is the best food in the world, Newari food like bara, yomari, chatamari are still my all-time favourites. I still remember my grandma and my mum making them for us when we were little. I didn’t know how to make most of these Newari foods when I first came to Australia but I have learned how to make some of them now. And I am determined to learn more in the future so I can make them for my friends and family. We had heard that a new restaurant called “Bhanchha” had opened in Sydney a while ago advertising themselves as “The Nepalese Newari taste”. As there are hardly any places else for us to go and try authentic Newari food, we were meaning to go there for a while. Finally, we managed to go there with some of our friends last week. I was a bit surprised with the casual look of restaurant as I had fine dining in my mind. As we walked into the restaurant, the front area was empty and no one was there to greet us. We kept walking until we reached the inner half of the restaurant. There the waiter showed us to our table and handed us the menu. The menu was just a normal one so I got the idea that they want to be casual dining and not fine dining. Looking at the menu, I was transported to Kathmandu straight away. They were serving Haku chhoyal (grilled spiced meat), fokso (goat lungs) fry , Jibrao (goat tounge) fry, Nhyapu (goat brain) fry, Bhutan ( intestine, giblets etc.) fry, Tahakhala ( special jellied meat), Sanya khuna (special jellied meat with fish) as well as bara, chatamari, aaloo tama. I stopped on the first page as there were so many things I wanted to try. After thinking about it, we ended up ordering momo (of course), Fokso fry, Jibrao fry, Nhyapu, Sanya khuna and Samay Baji set. All food came to our table in reasonable time and they looked very appetizing. All of us agreed that the food tasted very authentic and were delicious. We had one non-Nepali in our table and he loved all the food too. I just love their Nhyapu out of everything and we ended up ordering one more serve of it. I was really impressed because they all were typical Newari food and it is definitely a privilege to get that so easily in Sydney. One thing I didn’t like was Sanya khuna as it was not as set as it was supposed to be. It was a bit runny instead of jelly. But the taste was still good, may be they just needed to make sure they serve it straight from the freeze to the table. In Samay Baji set, I was happy to taste chhoyala, aaloo tama, achar, bodi and bhatmas. All the food was definitely good and it was a perfect place if you are trying to introduce Newari cusine to someone new. We also tried Ranjana ko Cola, special type of drink where coke is mixed with spices to enhance the flavour. I was not a fan of it in Nepal and I didn’t find it very special but my husband told me that it did taste like what he used to drink during our school years in Nepal. If you are in Sydney, I recommend this place to try Newari cusine. The price of food is very reasonable as we ordered lots of food and end up paying only $20/person so it is definitely value for money. Just remember it is not fine dining when you go there so you don’t get disappointed by the look of the place and their service. The only disappointment was I wish they looked after the toilet a bit more. The ladies toilet I went to had no lock and it was not too clean. Food wise the restaurant is really good and the place can be better if they improve the ambiance and service. We are already planning to again soon and this time we are taking more of our Non Nepali friends so they can enjoy typical Newari food. P.S: We believe that when an animal is killed for consumption, no part of the animal should go to waste and Newar people have mastered how to make each part delicious over the years. I am sure anyone who has ever tried Newari cuisine will agree with me. P.S.S: Do not forget to nominate your favorite blog . 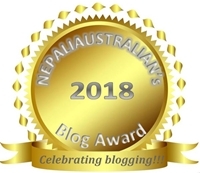 This entry was posted in Foodie, Nepal, Newari Food and tagged australian, bara, Bhanchha, Bhutan ( intestine, chatamari, fokso (goat lungs) fry, food, giblets etc.) fry, Haku chhoyal (grilled spiced meat), Jibrao (goat tounge) fry, kathmandu, Nepal, Nepali, nepali australian, Nepaliaustralian, newari, Nhyapu (goat brain) fry, Restaurant, Sanya, Sanya khuna (special jellied meat with fish), Sydney, Tahakhala ( special jellied meat), The Nepalese Newari taste, yomari. Bookmark the permalink. I have been there now couple of times and every time they hit me with their best shot. Sanya Khuna, Bara, Chatamari, Fokso, Jibro, Pangra, Bhutan, pau kwa, takhala and the list goes on. After all these years in Sydney, this is the first restaurant to offer all these varieties. Definitely going back and recommended to all who wants to tickle your taste buds. Pleased to read your article re our Restaurant BHANCHHA. I will take your comment re our services like toilets and others as positive. I will work on it from today onwards seriously. Looks yummy… just had some homemade momos at work, mmmmmm! Wow, so glad to know that you get to try momo. Did you like it? The food was awesome but how can they ignore the bathrooms I don’t understand. When you are in Sydney please try them. I think you will love it. Enjoy ur holiday…Any plan to come to Sydney? I recommend you try some Newari/Nepali food at Third Eye Bar. They have some of the Best tasting food in Sydney. 370 Princes Hwy, Rockdale, NSW, 2216. Dinner only except Mon/Tue.